Across the country and here in our community people look forward to the Girl Scout Cookie Program. The cookies are delicious, and seeing the girls out in the community helps to remind the public of our outstanding organization. This year, order taking will begin the first week in January, and Girl Scout Cookies® will be available through booths sales until mid April. Cookie rallies will be held at Roosevelt Field on Saturday, Jan. 8, at Green Acres Mall on Saturday, January 15 and at Broadway Mall on Saturday, Jan. 22. As good as the cookies are, the Girl Scout Cookie Program is about so much more than the actual cookies. The Cookies are just one of many tools and activities that make the Girl Scout Leadership Experience one of the most valuable resources available to girls … The Girl Scout Cookie Program affords girls the opportunity to learn and earn. Goal Setting: Everyone needs a goal, and a plan to reach the goal. Goals without a plan are just wishes! Learning to set goals through the Girl Scout Cookie Program carry over to daily life, and goal setting allows girls to dream big and achieve! Girl Scouts may want to take a trip, engage in a special activity or set aside funds to support a project in their community – or elsewhere – that will make the world a better place. Decision Making: Every aspect of life is impacted by the decisions that we make …In the Girl Scout Cookie Program girls can decide as a group on the activities and community projects that they wish to support. Girl Scouts learn how to make decisions based on the shared values of the Girl Scout Promise and Law, and they learn tactics for making decisions that weigh the pros and cons, and allow each girl to have a voice. Money Management: Girls reinforce basic arithmetic skills and make change. More importantly, they learn the value of money as it applies to reaching a goal. They learn the relationship between how much things cost and the work involved to earn the money to pay for things, activities and projects. Too many children today have a significant disconnect in their lives between earning money and buying things, and the Girl Scout Cookie Program provides real experience in earning, saving and spending. household. She will be able to influence others in her work and in the community. She will know how to use her talents and her resources to make the world a better place – today and for the rest of her life! 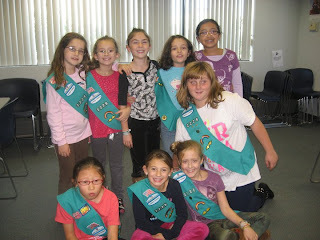 For more information on the Girl Scout Cookie Program, please visit our website at www.gsnc.org . You may also contact me at Girl Scouts of Nassau County, 516-741-2550, ext. 200 or email ceravolo@gsnc. Starting in February our website will be able to direct you to the Cookie Booths nearest to you! Previously published on the Garden City Patch. Girl scouting has never been more needed than today. Research shows that girls who maintain self-confidence, who have strong values and who have other girls and adults to whom they can turn to for advice and comfort are more likely to succeed in school and in life. Girls today often live under pressure. Their parents and schools expect high performance – in academics, on the playing fields and in extracurricular activities. Friends want them to conform. The media lures girls with images of beauty that are unreal and unobtainable, and bombards them with music, fast food, stories and constant electronic connections that give them so many confusing messages on how to look, behave and be their best selves. In other words, girls today are under a lot of pressure. This pressure and stress can directly affect a girl's physical, social and emotional health. Some girls eat too much, or too little. Others engage in behaviors that range from unproductive to unwise, to situations that put their own safety and the well-being of the community at risk. Sill others miss school because they are intimidated by bullies costing all of us - lost aid to schools, higher costs for parents and lost productivity in the workplace. The current obesity epidemic affects the entire community with higher costs for health care. Eating disorders, depression, substance abuse and gangs impact our communities with costs for remediation and law enforcement. But there is hope. Girl Scouts of Nassau County is addressing these issues and more, every day. We work with girls at the Troop level and individually to find a safe space where they can discover more about themselves and the world around them, connect with other people and ideas, and where they can take action to make the world a better place. What kind of values do you want for your daughter? Values that go hand in hand with programs that will you teach your child to care for others and the earth. That will help her build real skills for earning her way in the world. That will help her make friends and bring caring adults into her life. A place where she is safe and unjudged. A place where she can have FUN! That's what we offer here at the Girl Scouts of Nassau County. For more information, speak to a Girl Scout leader at your child's school or call the Girl Scouts of Nassau County Service Center at 516-741-2550 to register your child today!